Deliver the Stallion's Potion to Raerek or Reburrus. Obtain the potion from Bothela. Go to Understone Keep (or the Blue Palace, see below). Deliver the potion to Raerek or Reburrus. Bothela, an elderly Breton alchemist, can be found in her shop, The Hag's Cure, located in Markarth just west of Cidhna Mine. 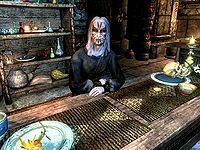 When asked about her shop, Bothela will say that the people of Markarth will often come to her, secretly, for cures. Bothela will go on to explain that she has a potion for the Jarl's steward, which she asks you to deliver. Bothela: "Comes with living to a ripe old age, people start thinking there's something magical about you. Then, the insults. Still, a little knowledge of plants and potions gets you by. Not that one likes to admit buying things from you. See? I even have a little potion for the steward. Mind handing it over to him? Just say that it should solve that problem he has." Accepting: "I'll make sure he gets it." Declining: "I don't have the time right now." Depending on your reply, Bothela's response will change. After accepting this task, the Stallion's Potion will be placed in your inventory. If declined, however, selecting the initiating dialogue will prompt the conversation again, giving you another opportunity to accept the quest. "Oh... yes... um... thank you. Here you go. Some gold for your assistance and your, discretion." After speaking with him, the Stallion's Potion will be removed from your inventory and Raerek will reward you with a leveled amount of gold. Bothela does not give you a reward, unless a friendly disposition counts. The Stallion's Potion is marked as stolen when it is in your inventory, which means if you get arrested and decide to pay off your bounty or go to jail, it will disappear from your inventory and the quest will get stuck unless you steal it back from the evidence chest in the hold's jail. In most cases, Raerek will be the target of this quest. It's possible, though highly unusual, to be directed to Reburrus Quintilius once he's the steward. In order to do so, however, you must have handed The Reach over to the Stormcloaks during Season Unending without ever having entered Markarth or the immediate vicinity. If you've already entered the area around Markarth, Bothela will still refer to Raerek as the steward and expect you to deliver the potion to him. Note that Compelling Tribute forces you to enter Markarth to talk to Raerek, so Season Unending is the only way to get Reburrus. Bothela still targets Raerek even if the quest is started only after the Stormcloaks take over. Mod Notes: The quest is started invisibly and aliases filled upon entering the Markarth region and the target never gets updated after that. Reburrus' dialogue has no audio. You can complete the quest by giving the potion to Reburrus, even if he isn't the current steward and target of the quest. On the PC, it is possible to use the console to advance through the quest by entering setstage FreeformMarkarthJ stage, where stage is the number of the stage you wish to complete. It is not possible to un-complete (i.e. go back) quest stages, but it is possible to clear all stages of the quest using resetquest FreeformMarkarthJ. This page was last modified on 1 December 2015, at 00:17.